Americas and Fathom Events are partnering to present the never-before-seen, 90-minute director’s cut of the hugely popular classic Doctor Who adventure, “Doctor Who: Genesis of the Daleks,” for a special one-night event on June 11 at 7:00 p.m. local time in more than 750 select movie theaters nationwide through Fathom’s Digital Broadcast Network (DBN). An exclusive interview with the Fourth Doctor, Tom Baker, will follow this special version. 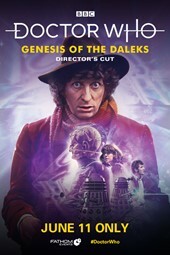 Tickets for “Doctor Who: Genesis of the Daleks” can be purchased at FathomEvents.com or participating theater box offices. Following the cinema event, the complete season 12 of Doctor Who comes to Blu-ray on June 19, featuring fan favorite Doctor Tom Baker. The Fourth Doctor and his companions Sarah Jane Smith and Harry Sullivan are transported thousands of years into the past to the ancient planet Skaro where they are given a mission from the Time Lords to prevent the evil scientist Davros from introducing to the universe the most destructive race of killing machines ever created, the Daleks. “We continuously strive to provide special moments for Doctor Who fans and we think this is a really fun and unique opportunity to see the popular Fourth Doctor, Tom Baker in ‘Doctor Who: Genesis of the Daleks’ while surrounded by other Whovians in a theater setting,” Julie Dill, VP Franchise Marketing, Creative, and Partnerships, BBC Studios – Americas, said. In the Americas, BBC Studios’ production unit in Los Angeles is responsible for ratings juggernaut Dancing with the Stars, critically-acclaimed The Night Of, and award-winning Life Below Zero, while local productions Dancing Brasil and Bake Off Brasil are breakout hits made in Brazil. The company manages joint venture relationships with AMC Networks for flagship channel BBC AMERICA (U.S.) - home of global brands Planet Earth II, Blue Planet II, Doctor Who, and Top Gear - and with ITV for SVoD service BritBox (U.S./Canada), as well as strategic partnerships in Canada with Blue Ant Media for BBC Earth Channel, Corus for BBC Canada, and Knowledge Network for BBC Kids.